Not only can Tiff drive cars very fast whilst being very sideways but he's got a lot of stories to tell having made it all the way to the top of the motorsport ladder - Formula 1. 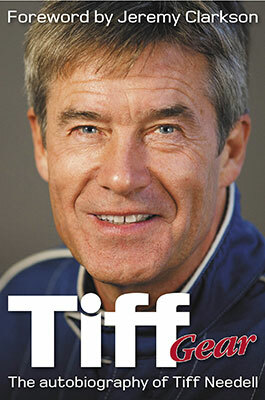 Written with honesty and humour, Tiff Gear is the engaging story of Tiff Needell's life around cars and motor racing. For over 25 years Tiff has been a well-known television personality, first on "Top Gear" - where he worked alongside Jeremy Clarkson - and then on Channel Five's "Fifth Gear". Besides this, Tiff had an incredibly varied and long motor racing career that saw him reach the heights of a Grand Prix drive at Monaco and escape unharmed from a horrific 200mph crash at Le Mans. He tells his unique story with pace and style in a book that all motorsport fans will relish. We're offering Tiff Gear with a discount on the retail price and Tiff will write a personalised message inside the cover. Making this the perfect present for any motorsport fan. Looking for something even more special? Check out the Tiff Needell BMW M4 passenger experience and feel what its like from inside the car whilst Tiff takes a new BMW M4 to the limit at Thruxton.